This month sees the commemoration of the end of hostilities in the Far East, in August 1945. After the Battle of Denmark Straits, in which HMS HOOD was sunk, HMS Prince of Wales was sent to the Far East to join HMS Repulse in Singapore. Both ships were attacked on the 10th of December 1941, and sunk by a Japanese aircraft off the coast of Malaya. Fifty years later (on the 10th of Dec 1991) a medallion was struck to commemorate the sinking, and a copy was presented to each of the survivors who, after the sinking, spent the rest of the War as POW’s in Japan. 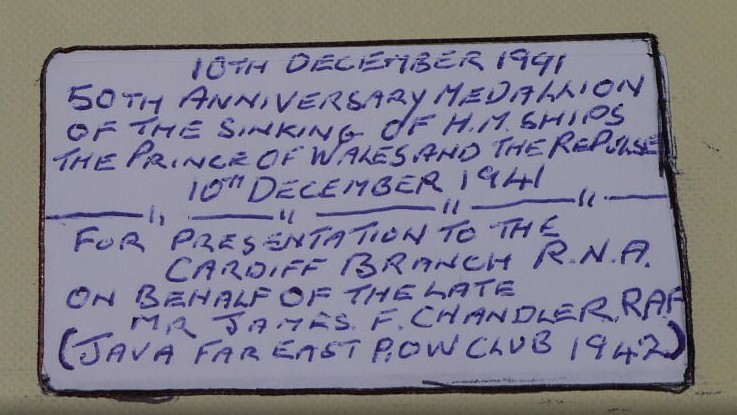 It is not known whether it was at a POW camp or back in Cardiff (after the war) that an ex RAF Airman, James F. Chandler, met up with one of the survivors. The survivor’s name is at present unknown, but it appears they became friends, possibly through becoming members of the Java and Far East POW Club. It is not known how James, an airman, came into possession of the medallion, but it is assumed that he acquired the medallion after the death of his friend. 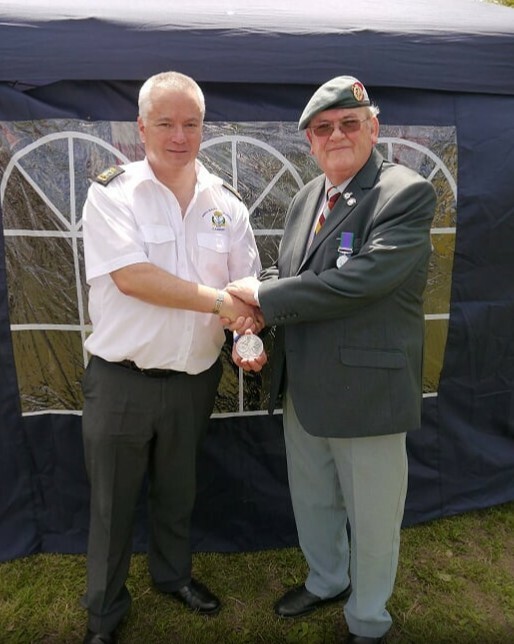 James himself had no family, so just before he died in 2013 he gave the medallion to his friend of 8 years, Bob Monroe, with instructions to see that it was placed in a suitable ‘home.’ Bob decided that the medal should have a ‘Naval Home’ and thus on Saturday the 27th of June, Armed Forces Day in Cardiff, he presented the Medallion to the Chairman of the Cardiff branch of the Royal Naval Association. The medallion is made of pewter and on the front face are the crests of the above mentioned ships, together with the date of the sinking and the place Kuantan, Malaysia. 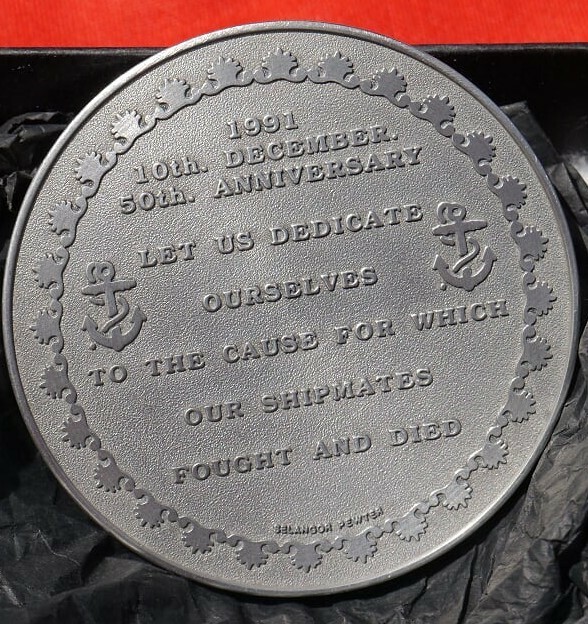 On the reverse face is the date of the 50th anniversary, the 10th of December 1991, and the inscription, “Let us dedicate ourselves to the cause for which our SHIPMATES fought and died“. Either side of this inscription are two anchors, all of which is surrounded by a laurel wreath. One option under consideration is for the medallion to be mounted, placed in a case and presented to the new aircraft carrier HMS Prince of Wales which is currently under construction. The Cardiff RNA meet at the United Services Mess in Wharton street on the first Monday of each month and informally at the City Arms (opposite the Millennium Stadium main gate) every other Wednesday.